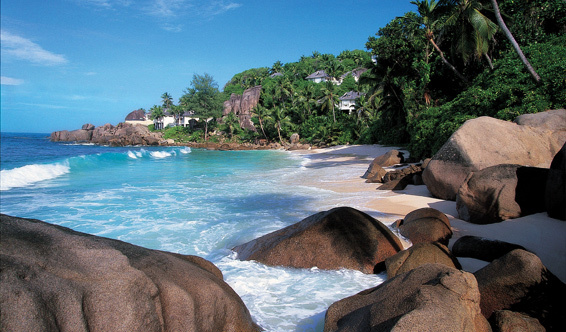 Along Interdence Bay, nestled amidst exotic flora and fauna, is where the granitic island of Mahe plays host to Banyan Tree Seychelles. A mere 25 minutes away from the airport, this timeless habitat of swaying palms and Takamaka trees will envelope guests in authentic Creole intimacy and hospitality. Hemmed in by unspoiled beaches and crystal azure water, Banyan Tree Seychelles provides the setting for the ultimate romantic haven against the backdrop of the Indian Ocean. 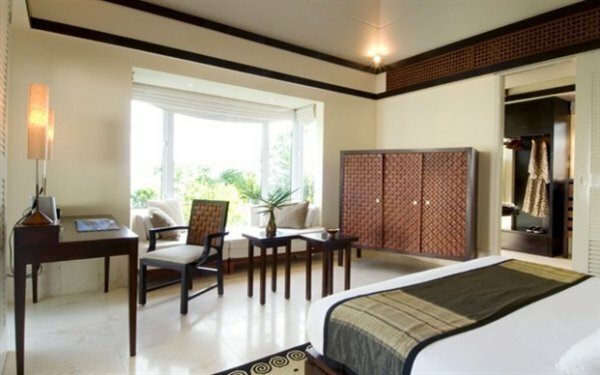 The 37 villas combine the best of Seychellois architecture with touches of contemporary colonial and plantation decor. From the high sloping ceilings, airy verandas, louvred doors and marble floors to the ethnic woven textiles, the villa interiors are a shining example of eclectic elegance. 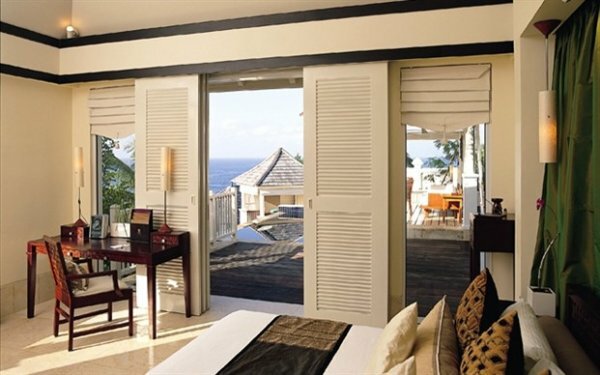 For ocean lovers there are 15 one-bedroom beach villas featuring private swimming pools and spa pavilions. If you prefer an elevated position high on the hill with glorious sea views, the 20 one-bedroom hill villas are the perfect choice. These enjoy separate living pavilions and private pools. For the ultimate in exclusivity there is the two-bedroom presidential villa, occupying its own private cove by the water’s edge. Sample novel continental fare at the all day dining, or simply relish a selection of succulent seafood and fresh fruit at the beach restaurant. 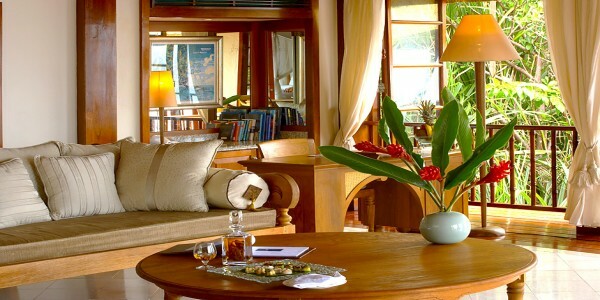 Unwind after a sumptuous meal by sipping an exotic cocktail whilst admiring the unimpeded ocean view at the bar lounge. 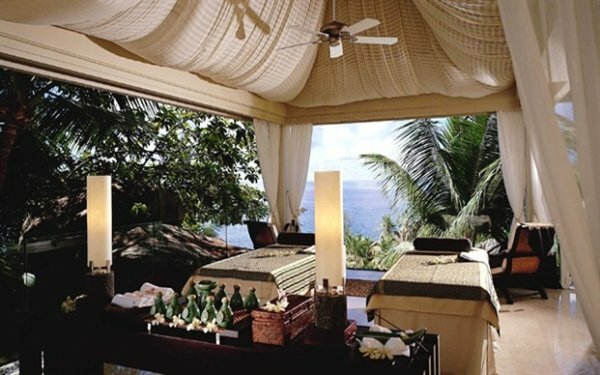 Luxuriate in the wide array of body pampering and soothing treatments at the Banyan Tree Seychelles Spa. 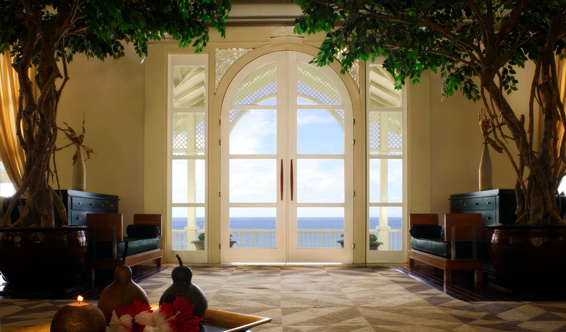 A session here will awaken your senses and leave you feeling rejuvenated and uplifted. 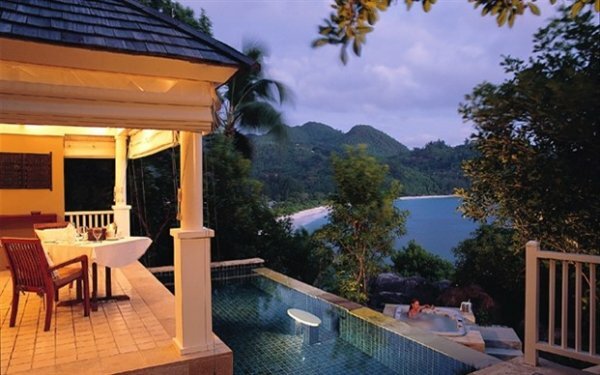 Banyan Tree Spa Seychelles invites spa fans to visit one of its eight luxurious hillside pavilions nestled within the virgin jungle vegetation with ocean views. Indulge in an exotic menu of spa treatments under the skillful hands of the Banyan Tree Spa therapists. Soothe your senses in a lush tropical forest setting, home to the award-winning Banyan Tree Spa Seychelles. At the Banyan Tree Spa’s luxurious hillside pavilions, highly skilled therapists will provide unforgettable treatments based on Asian healing traditions dating back centuries. All Banyan Tree Spa therapists undergo formal training at Banyan Tree Spa Academies. Their innate grace, attentiveness to detail and instinctive sensitivity to guests’ needs sets Banyan Tree Spa apart from the rest. Relax by the pool or unwind with a range of recreational activities. 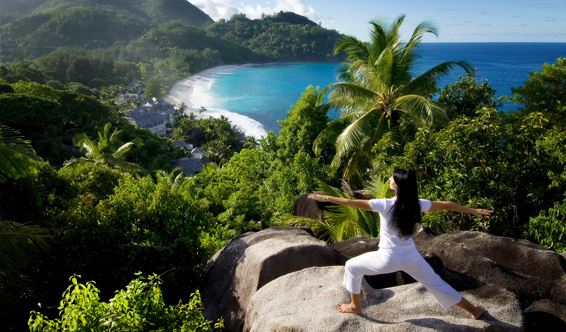 Enjoy a range of activities at Banyan Tree Seychelles from yoga to a game of tennis as you discover everything the resort has to offer. Surrounded by a beautiful landscaping and engage in a round of tennis for quick high energy workout. Our Gym at the Spa welcomes you every day from 7:30am until 9:00pm. Should you require assistance please do not hesitate to ask our Resort host for a private instructor. 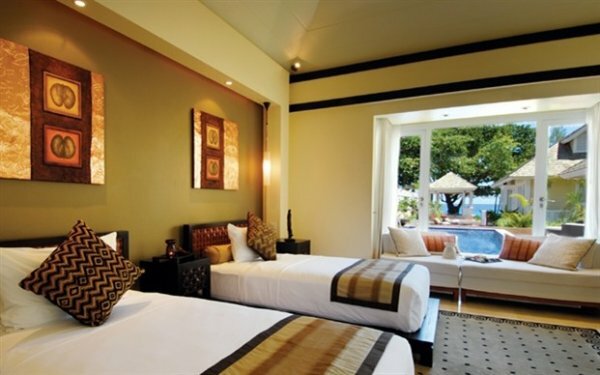 Banyan Tree Seychelles offers an ideal location for your conferences or corporate retreats. Seek inspiration in your surroundings and traverse new frontiers with a program that takes bonding and networking out of the boardroom. Detail new business strategies as you sail the high seas. At the end of the day, pamper yourself and relinquish weary muscles to the exquisite treatments provided by the Banyan Tree Spa. 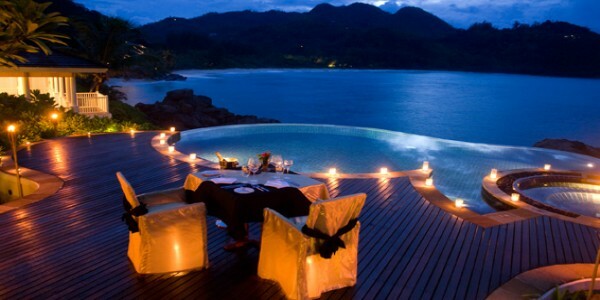 Celebrate the most important day of your life at the sensual and exotic Banyan Tree Seychelles. Spectacular views of the Indian Ocean offer a rare taste of paradise where relaxation and romance come easily. Intimate weddings can be set up on the beach or in the wedding gazebo. Make your wedding day an exceptional one at Banyan Tree for a lifetime of happy memories. Have an idea for a party for you and your friends? 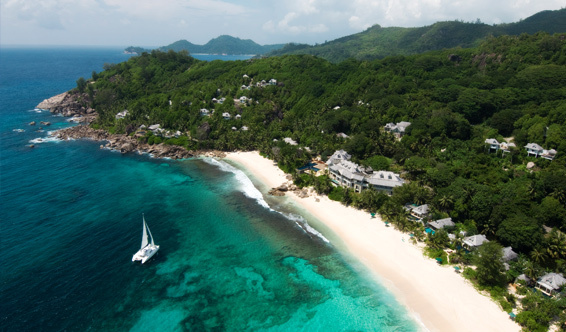 Banyan Tree Seychelles will make this event something you will never forget. Our discreet and welcoming staff will ensure your party will go off without a hitch. 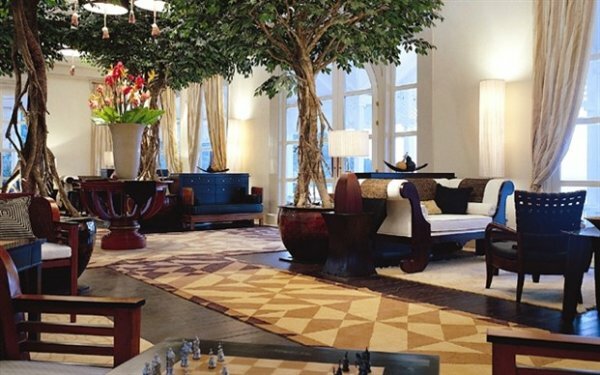 From intimate gatherings for a few friends to larger bashes, we will make it happen. If you prefer an elevated position high on the hill with glorious ocean views and serene rainforest all around, our Hillside Pool Villa is the perfect choice. The villa’s inspired architecture and interior furnishings reflect the natural style of the Seychelles through the use of indigenous materials. A small private swimming pool, veranda with sun loungers and open-air pavilion invite you to let the world pass by while spending leisurely days taking in the panoramic environment. Amidst the canopy of sheltering trees, privacy and tranquillity are easily found. Snuggled high along a granite mountain backbone, each of our Hillside Pool villas offers glorious views of the Indian Ocean and the surrounding rain forest. Thoughtful details such as the submerged ‘couple seat’ in the private dip pool, and an indoor sunken bathtub make up this romantic haven for two. The Pool Villa by the Rocks is evidence that nature is the world’s greatest architect. 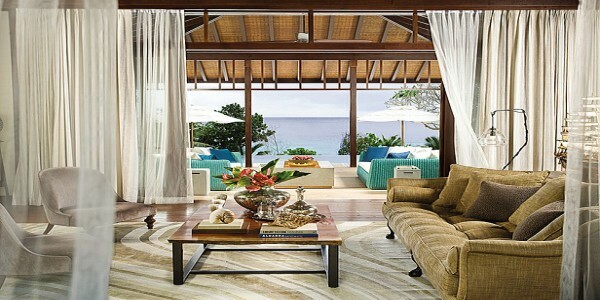 Kissing the silky sand of the Intendance Bay, the luxuriously appointed villas offer direct access to the beach. 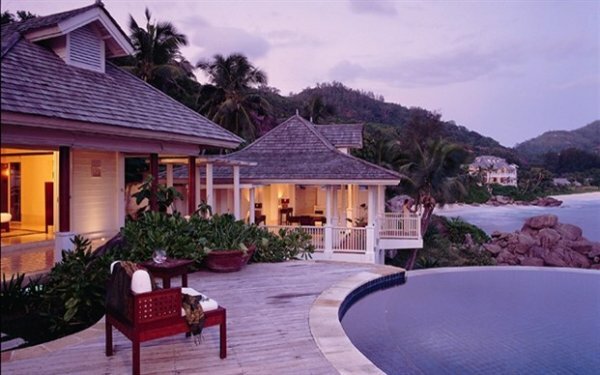 At the Beachfront Spa Pool Villa the pervasive ésprit of the Seychelles fills the air. You can’t fail to be enchanted by the sights and sounds of the ocean – from the powerful swell of the sea breaking on the shore to the refreshing breeze. The one-bedroom villa is extremely luxurious and spacious; giving you the convenience of a private swimming pool, massage pavilion, sprawling veranda, outdoor jet pool and steam room. Local artist George Camille was commissioned to produce unique art pieces based on the legendary coco-de-mer, the world’s largest nut, adding to the exotic splendour of these romantic villas. 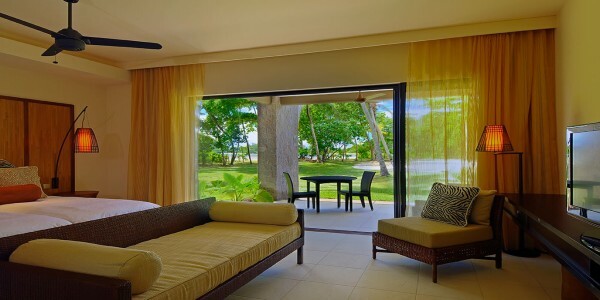 A delightful villa garden offers direct access to the silky soft beach. 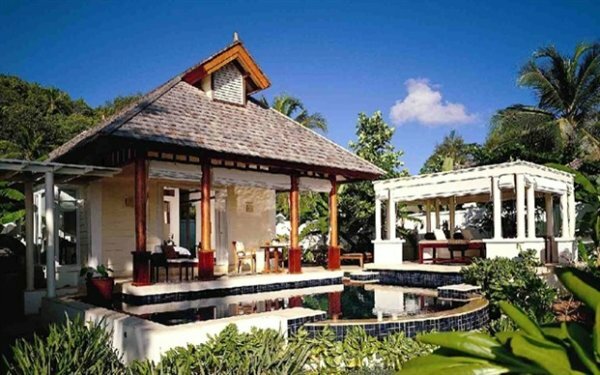 Excluding the tropical old world charm, the Intendance Pool Villa is a classic example of traditional architecture. From the spacious terrace of our five exclusive Intendance Pool Villas, you enjoy a stunning bird’s eye view of the Indian Ocean, Intendance Bay and the lush tropical mountain greenery surrounding Banyan Tree Seychelles. 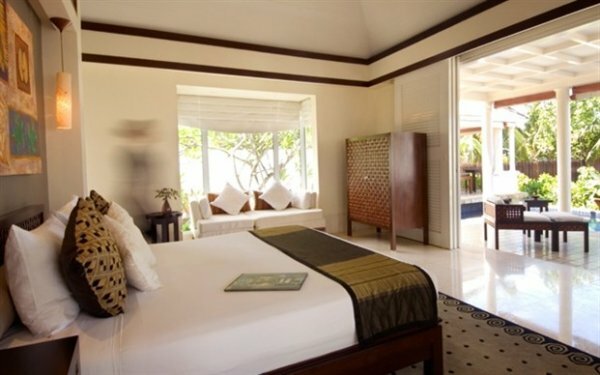 Wake up to the soft lapping waves of the Indian Ocean just outside your villa. Located just steps away from the beach, the stunning Two-Bedroom Double Pool Villa is the latest addition at Banyan Tree Seychelles. Spanning 826 sqm each and set amidst beautifully manicured gardens, each villa features two private pools, two open-air dining areas, a jet pool and two sprawling master bedrooms. 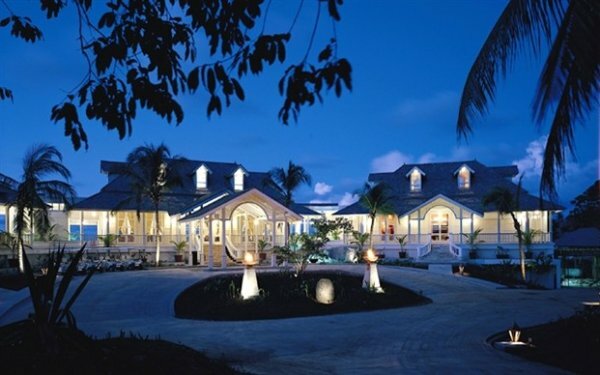 With a 24-Villa Host, it is perfect for hosting family and friends in the most exclusive and luxurious of locations. For the ultimate in luxury, exclusivity and privacy, stay at the exquisite Presidential Villa at Banyan Tree Seychelles resort, which occupies its very own private cove by the water’s edge. 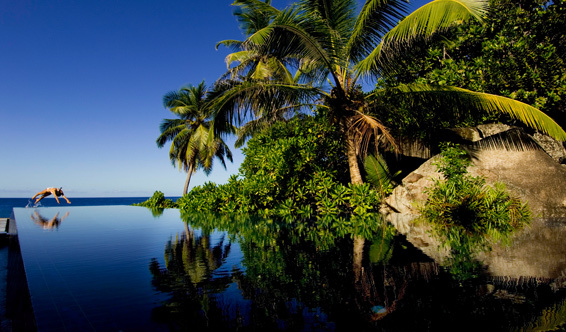 No expense has been spared at this secret hideaway; so you can explore the Seychelles in style. You can entertain family and friends on a lavish scale – the Presidential Villa can be combined with the adjoining Hillside Pool Villa to create a sprawling two-bedroom complex. 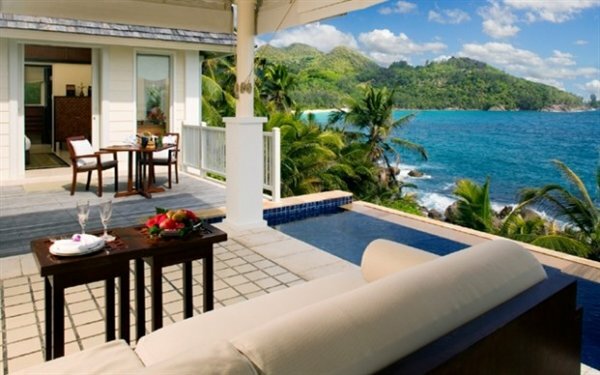 Soak in the dramatic scenery and let the magic of this awe-inspiring Seychelles villa hotel cast its spell on you. 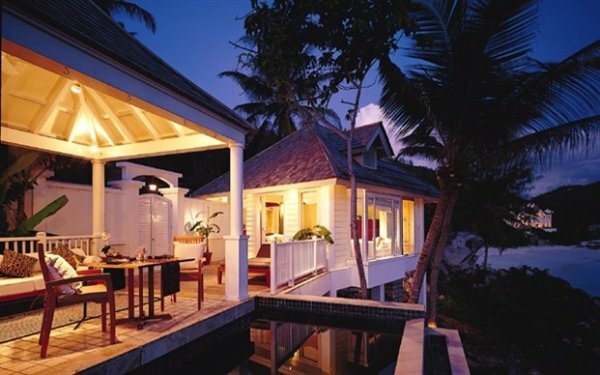 Tucked away in a private cove with a sweeping view of the Indian Ocean, be pampered by the finest in hospitality at the exclusive Presidential Villa. 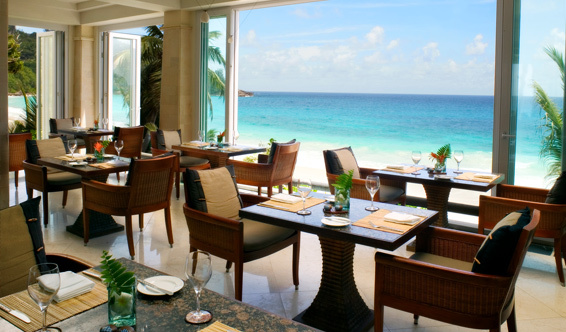 Against the backdrop of the Seychelles’ deep blue waters, a range of intimate dining experiences await. Specially created and conceptualised to epitomise the romance of travel, four exclusive dining experiences are available. An eclectic restaurant with a homely, African ethnic feel to it, Au Jardin d’Epices serves international favourites in a casual setting overlooking the bay. Full buffet breakfasts are on offer in the mornings, a selection of snacks, sandwiches, salads and light meals for lunch, and some fine international cuisine for dinner. Au Jardin d’Epices looks out onto the turquoise blue Indian Ocean and the idyllic surroundings of Anse Intendance – the perfect place for a relaxing meal. Saffron tantalises with award-winning Thai cuisine and Southeast Asian specialities. Discover the culinary arts of South East Asia, Thailand in particular, at Saffron, where our chefs prepare authentic dishes using traditional recipes and cooking methods. Unique Southeast Asian touches are incorporated into the service style and atmosphere of the restaurant. Like the countries of Southeast Asia – multi faceted, exotic and intriguing – the cuisines of Southeast Asia make up a mosaic of styles, each one as different as the social customs and age-old traditions that have shaped it. If you prefer to spend a thoroughly relaxing day in the luxury and privacy of your own villa, Banyan Tree Seychelles offers a wide variety of tempting menu items for breakfast, lunch, dinner and all the times in between. 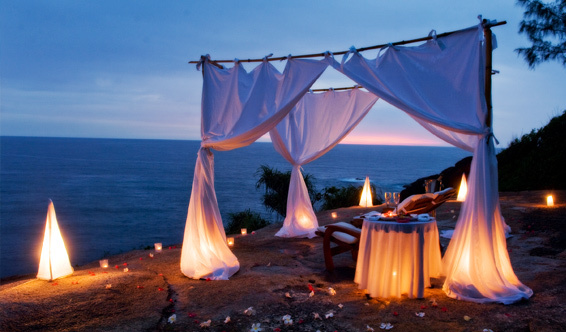 Try our special outdoor barbecues for a romantic night in. Relax around the pool and be pampered by our pool team. The Pool Bar serves thirst-quenching drinks, creative fruit cocktails and tasty snacks around our beautiful main pool. In the Seychelles there is no better way of beating the heat than a freshly squeezed fruit juice.